Founded by four developers from Swedish in 2017, Templ.io Managed Cloud Hosting platform is headquartered in a small town in Sweden, just west of Stockholm. Templ.io is a young and vital web hosting company, with a tempestuous passion for e-commerce in general, and WooCommerce in particular. 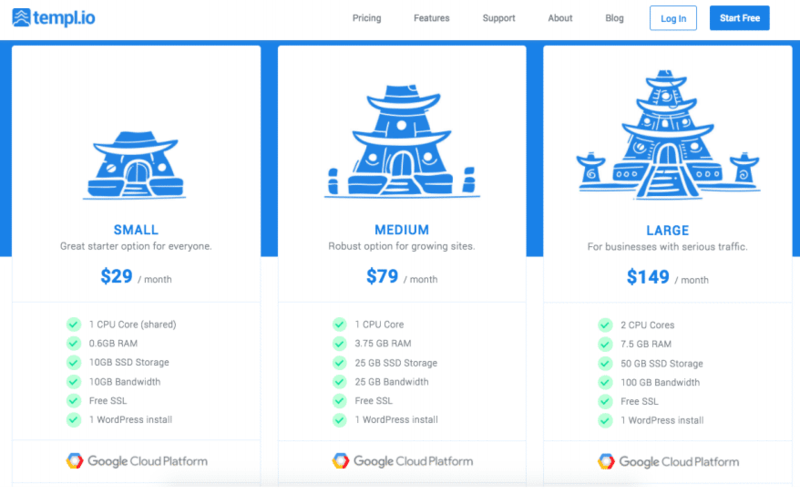 Templ.io’s innovative cloud platform offers you a truly managed WordPress + WooCommerce hosting experience powered by Google’s rock-solid cloud infrastructure. By default, all settings are optimized for the perfect WordPress plus WooCommerce setup for your online store. Moreover, they take care of your store’s online security as well. Google’s security model is built on over 15 years of experience focused on keeping customers data safe on Google applications like Gmail and Google Apps. With Google Cloud Hosting your data takes advantage of the same security model. Google’s backbone network has thousands of miles of fiber optic cable and has edge caching services to deliver fast consistent and scalable performance for your website. In fact, Google even laid their own fiber optic cable under the Pacific Ocean. Google Cloud Platform is also one of the most environmentally friendly cloud hosting providers. Their data centers run on half the energy of a typical data center, and they also purchase 100% renewable energy to match their consumption for their global operations. The first time you log in to your Templ.io Control Panel, you will be greeted by this screen. You will be displayed two options right away, either to create a website or to migrate a website. The latter is, of course, the choice for anyone who already has an existing WordPress site that they would like to migrate to Templ.io’s new and better WordPress hosting environment. Templ.io provides an easy migration solution for your WordPress site by making use of the Duplicator plugin. You can also contact Templ.io’s support team to migrate your website for you, as they offer free website migration services along with all new plans. 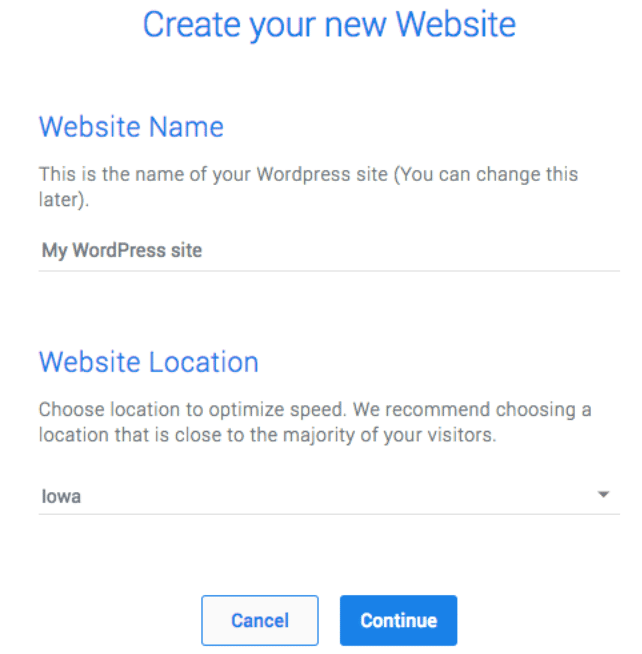 For creating your brand new WordPress site, all you need to do is give a name for your website and choose the server location, that is, the place where you want your website to be hosted. Always choose a server location that is nearest to the country visitors whom you are targeting. After you have named your website and chosen a location for it, Templ.io will setup and configure your own Google Cloud server. It is worth noting that this server is not shared with anyone else like the traditional shared web hosting plans. Once your server is set up, WordPress will automatically be installed for you. Both these processes are done automatically and may take up to 5 minutes for it to fully complete. Once the above step is complete, your website can immediately be accessed through a temporary domain assigned to you by Templ.io. You can change this to your own custom domain later on by going to the ‘Domain’ tab from the control panel. Highlighted here in the screenshot is the link to view the website you just created, and to login to the WordPress admin area. One thing to note here is that Templ.io automatically installs a ‘Security Token’ plugin to your website that allows you to login to your WordPress admin dashboard without having to enter your username and password (second arrow in the screenshot). This passwordless login is only accessible from within Templ.io’s control panel. But if you want to log in manually by visiting yourdomain.com/wp-admin/ you can, of course, do that as well. But, passwordless login is a very good security feature. Moreover, it is cool and especially handy if you have got more than one website hosted on Templ.io. The control panel is very easy to use and has all the basic features you might need for managing your website. If you want to upgrade your subscription plan, you can always do so easily from within the hosting panel. This feature will come in handy when your website grows and requires more server power. You can also change the server location of your website very easily, which is a nice addition to the controls present on your hosting panel. When these locations are officially supported by Google, they will also be available in your Templ.io control panel. New server locations are always announced on their blog as and when they become available. Backups are very important for any website, and Templ.io offers daily automatic backups that are saved for 30 days each before they are overwritten by new copies of your backups. These backups are stored on a separate server and do not count towards your total disk space usage, which I feel is a very nice addition to regular backups offers by other web hosting platforms. You can also create or restore a backup manually with just a simple click from your Templ.io control panel. Moreover, the backups can also be downloaded to your personal computer. Templ.io has partnered with Let’s Encrypt to offer you free SSL certificates for your sites out of the box, with automatic installation and renewal. It’s always a good practice to run your website over SSL, that is, make use of HTTPS instead of HTTP. 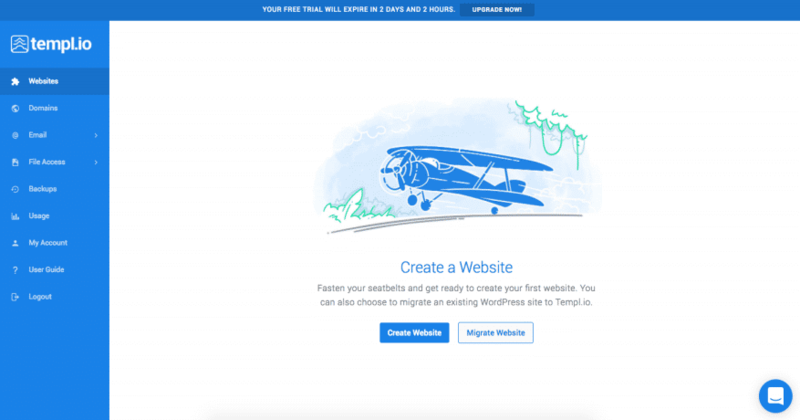 If you want any help migrating your WordPress website to Templ.io, you can get in touch with their highly responsive support team and they will help you with the whole migration process, completely free of charge. Providing good support for their customers is essential for any web host, and Templ.io is always ready to help you when you need it. Support channels include live chat, email, and telephone. Templ.io offers secure file access to your website via SFTP, which is much safer than the old unencrypted FTP method. If you are looking to create a new WordPress site, the Small plan should be more than enough. But you can easily upgrade your plan to Medium or Large later on as your website grows. As a special offer to potential customers out there who would like to try their platform before going with a paid plan, Templ.io is offering a free trial of their managed cloud hosting platform for ten days. All you need to do is, visit Templ.io and sign up with your email address. 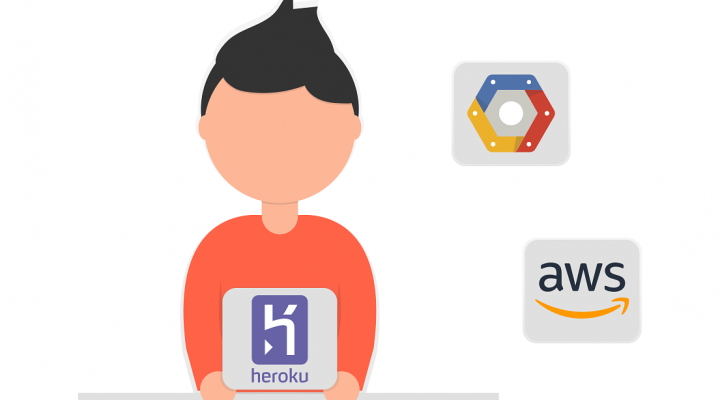 You can also sign up using your Facebook or Google account to try their Managed Google Cloud WordPress hosting for yourself, completely free for the first 10 days. And the best part about it? No credit card is required for signing up and testing their platform. So, there are no worries of getting your card charged for something you don’t want to use. 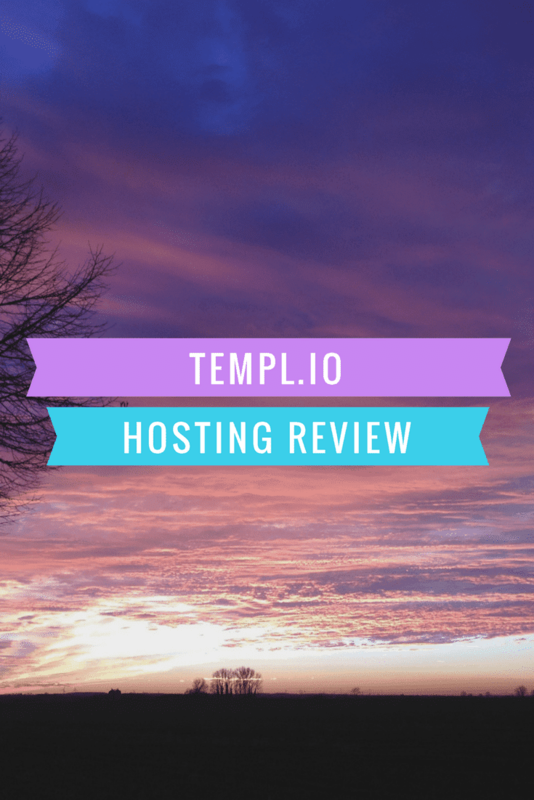 I hope that you found this Templ.io managed cloud hosting review quite useful. In case you have got any doubts or got stuck in between while setting up your website on Templ.io, feel free to get assistance by leaving a comment below or getting in contact their live-chat support team (recommended). They should be more than happy to assist you. Pin this on Pinterest, would you? Templ.io managed cloud hosting sounds good, I’ll have to test it to know for sure, same things happened when I read reviews of Managed Cloud hosting by Cloudways on Wpblog, once I tested it, I got to know that it was awesome. Hello Bram, you can get started with Templ.io by signing up for a free account on their site. You can later upgrade to their paid plans if you really liked their services and performance. Great review. I appreciate your effort to review Templ.io, but in managed cloud hosting I prefer Cloudways. Hello John, thanks for sharing your preference with us. It would be great if you could tell us why you prefer Cloudways over Templ.io as it would add more value to the article and help people who stumble upon this review. You’re welcome Jerry, thanks for sharing your experience with us.